Thanks to global warming, summers probably aren’t going to get any more bearable. Here in Vancouver home air conditioners aren’t all that popular, but I’d wager that’s about to change as heat waves start happening more often and lasting longer. That’s why I decided to order up a portable air conditioner for my home office. My criteria was pretty simple: its gotta be cold, its gotta be cheap, and it had better not break one week in. 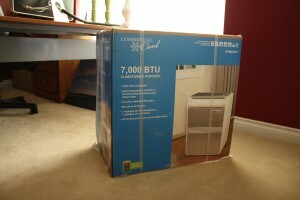 So after considering about half a dozen different models, I settled on the Haier Commercial Cool 7000 BTU Portable Air Conditioner (CPRB07XC7).